This article describes Microsoft Project Online application development for desktop applications using the .NET Framework 4.0. The application described in this article retrieves information from the hosting server. Project standard edition is a desktop application that runs as a stand-alone application. Project professional edition is a desktop application that can interact and share data with a server on a larger scale, as well as perform the functionality found in Project standard edition. Project Online is a Microsoft-hosted service that provides companies with a PMO-level solution to coordinate and manage projects, programs, and portfolios. A different offering than the desktop editions, Project Online can maintain and track project details throughout the life of a project. Project Server is an enterprise-hosted service in which the enterprise manages and secures the server containing project, program, and portfolio information. Project Server, by virtue of securing the server in-house, offers the project, program, and portfolio oriented features of externally-hosted Project Online with a greater capacity for customization. The .NET CSOM implementation is the preferred interface when developing Windows applications that interact with Project Online tenants. Typical environments for user-centric applications include Windows desktops and Microsoft Surface devices. Back-end applications written with .NET CSOM can connect to other servers for business logic and data sources that are external to Project Online. Retrieval requests to Project Online use a LINQ-like query system that offers several enhancements over basic retrieval functions. The REST/Odata model provides HTTP-based communication, This interface is recommended for applications in non-Windows environments. Communication endpoints are the objects in the Project Web Application (PWA) site. Results provide normal HTTP status codes. This article focuses on an application that uses the .NET CSOM interface. .Net Framework 4.0 or later -- Use the complete framework. The download site is https://msdn.microsoft.com/vstudio/aa496123.aspx. Visual Studio 2013 or later -- Any edition is acceptable. The community edition of Visual Studio 2015 was used to develop the sample application. The community edition is available at https://www.visualstudio.com/en-us/products/visual-studio-community-vs.aspx. SharePoint Client Components SDK -- Project Online and Project Server sit on top of SharePoint, and SharePoint assemblies. The SharePoint Client Components are included in Visual Studio Professional and Enterprise editions. If you use Visual Studio Community edition, the latest version of the Office Developer Tools SDK is available at the following site: https://www.microsoft.com/en-us/download/details.aspx?id=35585. A Project Online account -- This provides access to the hosting site. For more information about obtaining a Project Online account, see https://products.office.com/en-us/Project/project-online-portfolio-management. The standard .NET Framework (4.0 or later) is the correct framework to use. Do not use the .NET Framework 4 Client Profile. In developing a desktop application for SharePoint, the preferred interface is the Project client side object model (CSOM). You can download the complete sample at https://github.com/OfficeDev/Project-CSOM-List-Projects-Tasks. The first two topics cover basic issues: creating a Visual Studio project with appropriate namespaces and assemblies, and accessing the hosting server. The remaining topics deal with retrieving information through the CSOM, from one and many objects. Retrieving information from the host is a two-action process from client applications. First, the application specifies and sends one or more retrieval requests to the server. Second, the application issues a notification to the server to execute the submitted queries. The server responds by sending the query results to the client. The application setup consists of creating a new project, linking the appropriate assemblies and declaring the needed namespaces. Visual Studio presents several types of development projects. Launch Visual Studio and select Start A New Project on the Start Page. The New Project dialog displays available application templates, and data fields for any selected template. From the Installed templates in the left pane, select C# => Windows => Classic desktop. At the top of the central pane, select .NET Framework 4. From the application types in the central pane, choose Console Application. In the bottom section, specify a name and location for the project, and a solution name. Also in the bottom section, check the Create directory for solution box. Click OK to create the initial project. The VS solution needs the ProjectServerClient assembly from the Project 2103 SDK, a couple of assemblies from the SharePoint SDK, and the .NET Framework System.Security assembly. In the VS Solution Explorer, right-click the References entry, and select Add Reference… from the shortcut menu. If needed, click the Browse… button at the bottom of the dialog and navigate to the Project 2013 SDK installation directory to locate the assembly. Add the PrjoctServer Client namespace to the .cs file. Add the SharePoint 2013 SDK assemblies using the NuGet Package Manager Console. From the VS Tools menu, click the following menus: Tools => NuGet Package Manager => Package Manager Console. The Package Manager Console provides a description of the command results; and, the VS Solution Explorer displays the SharePoint assemblies in the project references. Select Assemblies => Framework in the left pane of the References Manager dialog, then check System.Security. Project Online is a SharePoint application, so using SharePoint authentication is the correct approach. The following code fragment prepares to access the hosted environment. Create a context object for the projects -- this is contained in the following code of the preceding code fragment. The context is inherited by other components, allowing the system to manage the context of the Project object model. Identify the host site -- this is done in the following code from the preceding code fragment. When instantiating the projects context, the application needs to provide the root of the Projects site collection. The application uses a substring of the URL of the root of the Projects. A snapshot of this location is highlighted with a red rectangle in the following illustration. The authentication needs the string from its start through the substring "pwa". 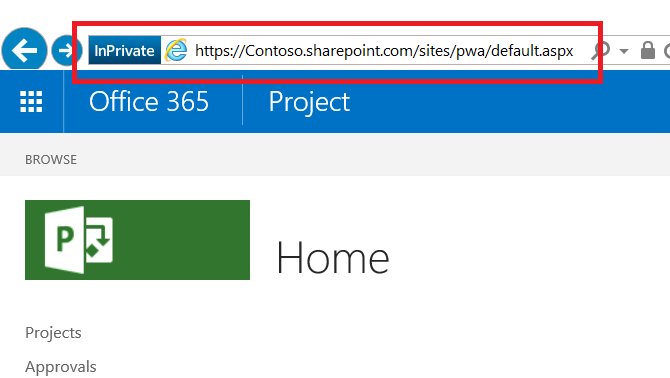 In the code listing, the application uses the string "https://XXXXXXXX.sharepoint.com/sites/pwa". Place the password in a secure string -- this is done in the following code from the preceding code fragment. The password and user account are the credentials to access the host site. Add the user account and password to the credentials portion of the context object -- this is done in the following code from the preceding code fragment. The instantiated project context is ready to use. Establish a context for communication. The context is used by the projects collection, as well as other objects and collections through inheritance, including the tasks collection, assignments collection, the stage object, and custom fields. Use the object model to specify an object, collection, or data to retrieve. This step uses LINQ as a query or as a method. The specification controls what you receive. Often, this step is embedded as the body of the Load method (step 3). Load the retrieval specification from the previous step using the Load() or LoadQuery() method. For loading collections and objects, use Load(). For queries with clauses such as "where" and "group", use LoadQuery(). Execute the request using the ExecuteQuery() method. The ExecuteQuery() method notifies the host that the query or queries are ready to execute. Once the host receives notification, it executes the queries and sends the results to the client. With the information at the client, the application can use it. The following code fragment cycles through the published projects and prints the Id and Name for each published project on the host. // Get the list of projects in Project Web App. Using the actions from the previous code fragment, the application retrieves the list of projects in the specified account on the hosting site. The ProjectContext is specified for the projects to list. Specify the item to retrieve. By only stating the collection, the server retrieves the project collection, populating each project with values for the default set of properties. Accessing properties that are part of the default property set gives successful results. Accessing properties that are not part of the default set results in a "Not initialized" exception. This is part of the previous step. Properties that are not default properties must be specified in the request to the server. The next code fragment loads the projects collection context as in the previous example. Then, the specification requests additional non-default properties to include in the result. The load statement specifies the projects collection context, and adds the StartDate, Phase, and Stage to the query result. The additional properties can be scalar, objects, or collections. Scalar items can be accessed directly. Objects and collections require additional processing, as in the following code fragment. // reference not being set to an instance on the server. // Phase and Stage are not published with the rest of the data. Need to pull these objects from the server. //if-else fails because the else case fails with "Microsoft.SharePoint.Client.ServerObjectNullReferenceException". //Again, not using if-else combination for the same reason as above. Establish the context of the projects collection. Retrieve the project information, including the Task properties. Note that the application is addressing published projects. The context for the current published project is pubProj. Establish the context for the Tasks collection. The pubProj.Tasks property references the tasks of the current published project. Load the specification to retrieve Task collection, including the appropriate non-default properties. Execute the query to retrieve the Task collection with the appropriate properties. The information is now local. The following code fragment processes the published tasks collection by writing the information to the console. int k = 1;    //Task counter. Each task can have one or more persons (a.k.a. resource) contributing toward its completion. The Assignments and Resources collections contain this information for each task. Obtaining a context for the project task. Build a request and load the request for the assignments tied to the task. Execute the query for the assignments. Build a request and load the request for the resource associated with an individual assignment. Execute the query for the resource. The Assignments collection is explicitly requested in the information from the server because it is not a default property of the Tasks collection. As a collection, a subsequent query is made to pull the collection from the server. The Resource is an object. The query for an assignment includes the resource name associated with the assignment. Custom fields exist for Project Online. These are enterprise-level fields that can be associated with individual project. This section describes how to access these fields. Tunnel to the custom field using its common name. Retrieve the internal name of the custom field. Return to the global context and query the system using the internal name of the custom field. This task specifies a retrieval that uses a non-default property with one added detail. Begin by using the projects context, as described at the beginning of this article. // Get the list of published projects in Project Web App. The p => p.IncludeCustomFields clause identifies the need to use a project object that supports custom fields. The p => p.IncludeCustomFields.CustomFields clause requests the inclusion of custom field data in the query result. This information is used after the custom field internal name is retrieved. With this information on the client, build a request to retrieve the custom fields associated with the current project. Locate the appropriate custom field and retrieve the internal name of the field. The internal name of the custom field is retrieved. High-level items 1 and 2 are now complete. Return to the project context and retrieve the value of the custom field. The value of the custom field is retrieved using the internal name as an index. Output of three projects consisting of project ID, project Name, custom field name, custom field internal name, and custom field value. For documentation and samples related to Project Online and application development using CSOM, see the Project Development Portal.